The first time I ever had a poached egg was in London. We lived there from July of ’03 to July of ’04 and before we moved over, his company sent us on a househunting trip. (And in typical Randy fashion, he finagled a side trip to Dusseldorf.) We went around London with three different real estate agents trying to figure out if there was a decent place to live in a decent neighborhood, that was even marginally in our budget. Over the course of the frantic three days that we were being driven all over town, here is what we saw in a nutshell. 1) Horrible places in good neighborhoods. 2) Basement flats with almost no daylight whatsoever. 3) Decent places with awful furniture. 4) Kind of nice places that were way beyond our budget. It was, to say the least, a little discouraging. We had just bought a new-to-us house in Seattle which I loved. Living somewhere awful, even if it was in London, seemed very depressing to me. As we inched our budget upward, we started to see places that were slightly less awful. A few I could even imagine myself living in. And then we found our flat. It was in Kensington on a dead end street (dead end street = less street traffic = quieter). The lovely street housed the Estonian and Fijian embassies. Up and across the street was the glorious Hyde Park. We could walk in one direction to Notting Hill and in the other to the Victoria and Albert Museum. The building was Virginia Woolf’s childhood home – our flat was the floor which had been her bedroom. The flat was nicely furnished with charming toile wallpaper and it was filled with light. It was expensive. It was perfect. After seeing it, Randy and I had lunch at a little place on the Kensington High Street. We talked about whether we could afford it – whether it was worth it to spend so much on rent. I had my heart totally set on it and he knew it. We ordered our lunch and when my salad came, I was dismayed to see what I thought was a giant hunk of cheese among the arugula (or rocket as they say there) leaves. But as I cut into it, I realized that it must be a poached egg – the likes of which I had never seen much less tasted. When I was a kid, my mom used to make us fried eggs over easy. I never liked them but, being the well-behaved child that I was, I ate them. One day she made scrambled eggs instead and I liked those so much better that I never made or ordered eggs any other way. 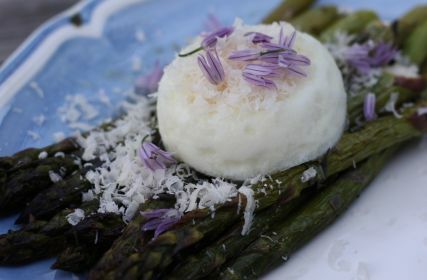 I knew you could poach an egg – but why? I never thought of eggs as anything other than breakfast food. My poached egg revelation was not so very long ago and I was, at that time, a very good cook. I just had narrow views about some things. London helped with that. For breakfast, I still love my eggs scrambled (the exception would be a toasted English muffin, a few leaves of spinach, a thin slice of tomato, and a poached egg). But you will often find me topping things with poached eggs for dinner. So much so that a year and a half ago, I bought an egg poacher. I find the put-them-in-simmering-water-with-a-bit-of-vinegar-and-swirl method a bit stressful. The egg poacher takes the stress out and gives you practically perfect looking eggs every time. I made this dish for dinner last week with a bowl of tomato soup and a cheese panini. I roasted the asparagus at high heat, drizzled it with tarragon and lemon juice right after taking it out of the oven, and topped it with the egg, followed by a bit of Parmesan cheese. I’ve been craving it ever since. Last night we had a friend of ours over for dinner. Randy picked up some salmon for the two of them and I made that amazing flatbread. I wanted a green salad but I also wanted this asparagus dish. So I made both. Of course, we took the flat in London. Randy got his company to help us out a bit with the rent. And then he got them to help out again when the dollar started to really tank against the pound. We spent twice as much on rent on an 800 square foot flat as we did on our mortgage for our 2,000 square foot house. But I loved living there. It felt like home in a giant city where we knew virtually no one. It was worth it. When roasting asparagus, I always get the thicker spears. If yours are thinner, they will not need as much time in the oven. Below I link to egg poaching instructions from Gourmet which are the ones I used before the egg poacher entered my life. If you want to make this dish more of a main course, serve two eggs per person and include some grilled crusty bread. Preheat the oven to 425 degrees. Meanwhile, snap the ends off the asparagus and give them a good wash. Lay them out on a baking sheet and drizzle with olive oil. Sprinkle with salt and pepper and mix to coat the asparagus evenly. Roast in the oven until a fork comes out easily of the thickest spear and they are starting to brown, 15-20 minutes. Shake once or twice during roasting process. Remove from the oven and immediately toss with the lemon juice and the tarragon. Allow to cool to room temperature. Divide the asparagus between two plates. Top with a poached egg and a shower of Parmesan cheese. Garnish with chive blossoms, if desired. This looks so stinking delicious AND beautiful! I’ve had something similar at Tavolata and absolutely loved it. And I want to egg poacher too! I’m going to add it to my wishpot. My poached eggs always turn out a mess. That is one perfect looking poached egg! I need an egg poacher. Sounds delicious with asparagus too. Looks fabulous. You just might convince me to get over eggs as a breakfast only food. I don’t know what kinds of looks I’ll get if I serve this for dinner in my house, but I know I would love it! No egg poacher here, though, so it won’t look as perfect (sigh). I LOVE poached eggs! This looks delish! Your poach egg is so perfect. I never serve it with asparagus, but it does sound delicious! I think that is the cutest poached egg I ever did see! I love the little blossom garnishes. Cute all around! 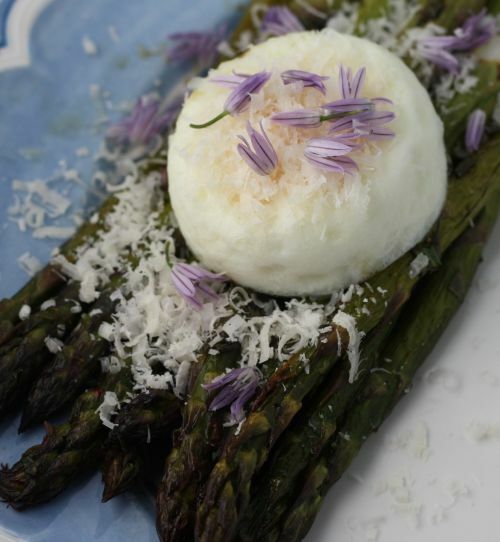 Asparagus and poached eggs are a match made in yumminess heaven. I always place a poached egg in my asparagus soup! that looks delicious. so simple, yet so elegant. i love that story. there is something so thrilling about moving to another country, and finding a place you can call home.